Should I Keep My Aquarium Lights On? Home > Ask Our Experts > Should I Keep My Aquarium Lights On? Whether or not to leave the lights on is a question which depends on the type of fish - and plants - you're keeping. As a rule, it's a bad idea to leave lights on overnight. Fish, just like people, need their sleep - not all of them close their eyes, but they all need to zone out for part of the day in order to stay healthy. 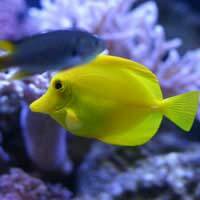 For most popular aquarium species, too much light can mean not enough sleep. Different kinds of fish have different sleep cycles, and some are nocturnal. Aquarists with nocturnal fish are often tempted to turn the lights on at night so they can see them properly, but this will usually leave them panicking and hiding immediately - it the long term it can create dangerous levels of stress. If you want to be able to see your fish after dark, you can get a special night light to make it possible. Using different frequencies of light and emitting a much gentler glow, this won't bother your fish. If you have coral in your tank, it may cause some of it to glow, creating a beautiful and distinctive night-time look. Though some aquarists prefer not to use lights at all, it's generally a good idea to keep one on during the day, as this will help your plants to grow. Unfortunately it will help algae too - another reason not to leave it on all night as well! Unless all your fish are equatorial in origin, it's worth adjusting the time you turn your light on and off in accordance with seasonal changes in daylight over the course of the year. Many fish have annual as well as daily cycles and this will help them to stay healthy. In species which have seasonal breeding habits, it can let them know when it's the right time to initiate mating behaviour. Fish are very quick to associate the turning on and off of lights with other aspects of their daily ritual, such as feeding times and the times when humans (and other pets) are most likely to be close to their tank. Regular rituals are helpful in maintaining a low stress environment - so much so that some aquarists use electronic times to manage the lights when they can't be there in person. I purchased a Betta Fish last month.He is in a 5-gallon tank.The temperature of his water is between 74-78 degrees F.The tank is near a window where he gets shaded sunlight.We use the aquarium light during evening hours when it is dark outside but shut the light off when we go to bed.The tank has silk plants for him to rest in.Over the last couple of weeks the tank has developed brown algae (diatoms).We were told this is common in new fish tanks in the first water cycle.The diatoms will die off and green algae will then replace the brown.I am assuming that at this point we should clean the algae out of the tank when we do a water change in a week or two?Or should we scrape off the brown algae from the glass now?We have the water tested at the local pet store and it is always excellent for all the parameters:alkalinity, nitrates, PH, chlorine, etc.Our fish seems happy and eats well. I found this really helpful. I have recently been bought a tank with fish and all plants n stuff (fake plants though). And I am very much a beginner in this area though my parents had a tank as a kid so not complete caveman! I have a clown loach, Plec (white and black stripes) and some little fish that I am not entirely sure what they are. So reading this has helped as learning about tank maintenance, lighting times, feeding times etc. Any tips, please feel free to tell me as welcome helpful hints!